Fiber-Mart’s DVI overFiber Video Converters-Transceiver+Receiver are the perfect choice for both large and small Pro AV installations. Featuring DVI video resolutions up to WUXGA 1920x1200 and HDTV video resolutions up to 1080p. 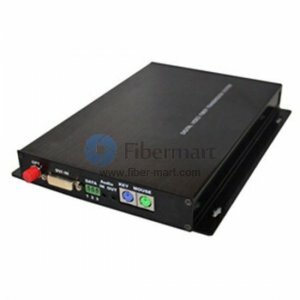 Fiber-Mart’s DVI Fiber Optic Converter, a flexible professional solution for long distance transmission of high resolution video signals through single fiber solutions, and single-mode or multi-mode fiber cables which allow for the transmission of accompanying stereo audio, RS232 data, Loopback output and support USB Keyboard/Mouse. applications include specialized Media Display, Security Systems, Universities, Industrial Monitoring, Airport / Airplane / Metro / Railway and large-scale conference sites including stadiums, where long distance transmission of computer video signals are necessary, fiber optic transmission ensures high quality signals with no interference.